When direct to garment provider AnaJet became a Ricoh company in late 2016, there was a great deal of excitement about the direction the organization was heading in. 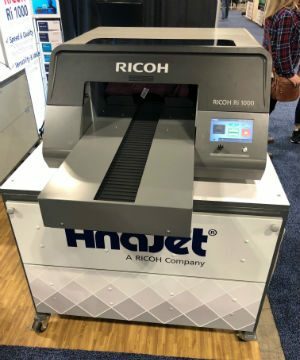 Since that time, AnaJet has not disappointed — first introducing the powerful Ri 3000/ Ri 6000 line of printers, followed by the Ri 100 and Ri 1000 which we had the opportunity to see at the Outdoor Retailer Winter Market in Denver. We caught up with marketing director Paul Crocker after the show to learn more about the company. IO: Please provide a bit of background about AnaJet. What makes your company different? 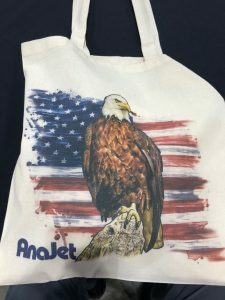 PC: AnaJet has been a true pioneer in the direct-to-garment printing industry starting with the mass production of its first printer line in 2006. 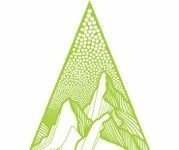 The main distinguisher that sets AnaJet apart is that we have developed a full DTG “ecosystem” designed to offer direct to garment printing solutions for practically every budget and experience level. For example, someone who wishes to start a t-shirt printing business, but has little-to-no experience or budget, can begin making money immediately by selling t-shirts and using the AnaJet Fulfillment Network (AJFN) to white label and ship orders to customers — without any set up fees or startup costs. Once that customer is ready to take their business to the next level and bring garment printing in-house, they can opt for the all-in-one Ri 100 desktop printer or the new RICOH Ri 1000 prosumer machine. On the opposite end of the spectrum are expert Ri 6000 owners who have added an additional revenue stream to their businesses by joining AJFN and using their high-end industrial printers to fulfill orders that come through the network. The AJFN, combined with a full family of Ricoh DTG printers that span the spectrum of price and feature sets, forms an ecosystem that provides a range of DTG solutions designed to help all of our customers achieve and increase profitability. No one else offers such an extensive set of DTG products and services designed to support its customers’ success. IO: How has AnaJet changed since becoming a Ricoh company in 2016? How has the company benefitted? PC: AnaJet has experienced major growth since it was acquired by Ricoh in 2016. Chief among the benefits of becoming a Ricoh-owned company is the ability to leverage and integrate Ricoh’s time-proven technology and industry-leading quality control processes and standards. Our machines are better, more advanced, and more reliable than ever, thanks to the integration of Ricoh-engineered components like the company’s world-class print heads and high-performance print engines. IO:What are some of the benefits of the new RICOH Ri 1000 printer? PC: The new RICOH Ri 1000 printer is designed to serve as a full-featured DTG printer at an affordable price. The machine offers gorgeous, high-resolution prints up to 1200 x 1200 dpi. Graphics also exhibit brighter, more accurate colors, thanks to improved print profiles in our new Kothari Advanced Pro RIP software. Perhaps the most notable benefit of the RICOH RI 1000 is how easy it is to maintain. Maintenance functions like intelligent auto clean, white ink agitation, and continuous monitoring of ink supply and air levels are all automated. For maintenance tasks that are not automated, the RICOH Ri 1000 utilizes a built-in interactive operation guide that displays alerts reminding the user to complete any necessary manual tasks. The machine is also versatile and incredibly easy to use. For example, magnetized quick change platens — available in a variety of styles and sizes up to 16 by 19.6 inches — easily snap on and off of the machine. This gives users the ability to quickly change set ups with virtually zero downtime. 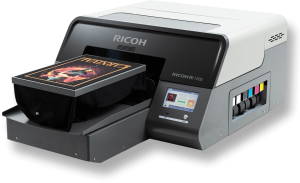 The RICOH Ri 1000 streamlines direct to garment printing. IO: What type of user was the Ri 1000 designed for? PC: The RICOH Ri 1000 was designed with prosumer-style use in mind and is intended for users who generally have mid-volume production expectations and desire a full feature set, but don’t necessarily need an industrial-level machine. However, a full range of prospective customers — from entry-level users launching their first DTG business to seasoned professionals looking to support higher volume production — have shown a lot of excitement for this machine. The RICOH Ri 1000 delivers robust features like white ink printing, highly automated maintenance, and very high quality, high-resolution graphics, but all at an affordable, mid-range price point that makes sense for their specific applications. IO: What was the other big item you had on display at OR? PC: In addition to the new RICOH Ri 1000 printer, we also brought the award-winning Ri 100 printer to Outdoor Retailer. The Ri 100 is a unique machine because it is the world’s first and only all-in-one direct to garment printer that comes in a highly portable desktop form factor. The machine also comes with a built-in garment finisher and an adequate amount of ink to print and sell enough t-shirts to achieve ROI. Because the machine takes up so little space (it easily sits on a countertop) and is available for less than $5,000, it is an excellent option not only for entry level users, but also for retailers or anyone looking for a safe, easy, economical way to print t-shirts on demand and on location. IO: What can we expect to see in 2019? PC: We always have exciting projects in the works here at AnaJet. With the addition of the new RICOH Ri 1000, we now have a full family of printers to complete our ecosystem of products that, together with the AnaJet Fulfillment Network of printers located around the country, work together to provide DTG solutions for practically every budget and experience level. Moving forward, expect to see the continued development of this ecosystem as we add improved support and functionality for new and existing customers.